This little cabinet was designed in 1778 for a hotel particulier in the wealthy but slightly out-of-fashion Marais district of Paris where the Megret de Serilly family lived. The tiny room was attached to one wing of the house and it seems that it could only be entered from the garden, making it a perfect private space. 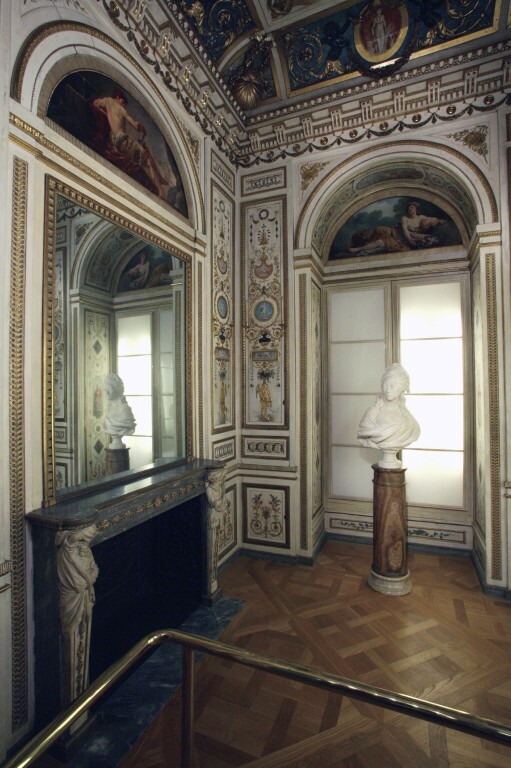 The cabinet was a pleasure room par excellenceand for a long time it was thought that it had been created at the instigation of Madame de Serilly during one of her husband's absences to surprise him on his return. The decorative scheme was designed and painted by Jean-Simeon Rousseau de la Rottière and Jules-Hugues Rousseau, also known as the Rousseau brothers. They are known for their work on Marie-Antoinette's apartments at Versailles (1772) and for the Queen's lavish Boudoir Turc at the Chateau de Fontainebleau (1777), south-west of Paris. The decoration of the panelling is carved out of the solid oak. Two colours of gold are used to add complexity to the design: the mouldings of the panels are gilded with a reddish gold, while the highlighted figures, leaves and flowers are in a more yellow gold. 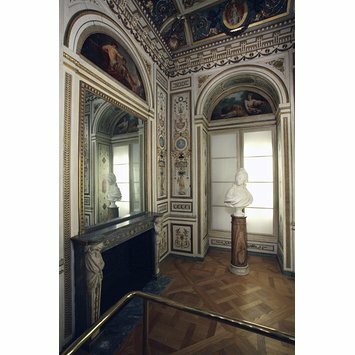 The white marble chimneypiece was supplied by Philippe-Laurent Roland, with gilt-bronze mounts by the royal bronzier Pierre Gouthière. The brothers excelled in the new arabesque ornament style, associating painted medallions imitating carving and small cartouches imitating bas-reliefs. Here the decoration is exquisitely refined, the carving and decorative painting so delicate that they could have been designed for a piece of fine furniture as much as for a room. The Sérilly family soon faced serious financial difficulties and had to give up the house only six years after the Cabinet was made. The Serilly family suffered harsh trials during the political upheavals of the French Revolution: the Marquis was guillotined in 1794, and the Marquise only narrowly escaped her husband's fate by claiming that she was pregnant. This little closet was made for the 16-year-old Anne-Marie Louise Thomas de Domangeville, around the time of her marriage to Megret de Sérilly in 1778. Monsieur de Sérilly was paymaster general to the French army. The house at 106 rue Vielle du Temple, that became the Hôtel de Sérilly, was purchased by the family in 1775 and was immediately re-modelled for them by Jean-Simeon Rousseau de la Rottière Financial difficulties meant that the family had to sell this house in 1784 and M. de Sérilly was eventually guillotined in 1794. The cabinet was attached to the outside wall of the house and faced south. Its only entrance was from the garden. A drawing by Rousseau de la Rottière exists for part of the design, in which the ornament follows Raphael's designs for the Vatican Loggia, published in 1772-7. It appears to have been dismantled and bought by the French dealer Paul Recappé (9 Passage Ste Marie, Rue du Bac, Paris), in 1867 and then sold to the museum in 1869. The Art Referee Report by Mathew Digby Wyatt (RF 8475/69) dated 26 April 1869 is very enthusiastic about the room. He mentioned that the house had passed from the Serilly family to the St Albin family, and was then sold, with the help of the antiquary Achille Jubinal (1810-1875), to Paul Recappé. Emilia, Lady Dilke, French Furniture and Decoration in the Eighteenth Century. London, George Bell and Sons, 1901, chapter IV, pp. 55-71. The whole chapter is entitled 'Rouseau de la Rottière and the Boudoirs of the Marquise de Sérilly and of the Queen'. The V&A room is illustrated on two plates. Benn, H.P and Shapland, H.P., The Nation's Treasures. Measured Drawings of Fine Old Furniture in the Victoria and Albert Museum. London: Simpkin, Marshall, Hamilton, Kent & co. Ld and Benn Brothers Ltd., 1910, pp. 9-10 and illustrated as frontispiece. In 18th-century Paris, wealthy women often had a small, private room for their own use. This one was commissioned around the time of Anne- Marie-Louise de Pange’s marriage to Antoine Megret de Sérilly. It was situated between the house and the garden. The decoration represents the four seasons and the cycle of life. The decorative scheme was designed by Rousseau de la Rottière. The marble chimneypiece is the work of Philippe-Laurent Roland, with mounts by Gouthière. The painted decoration may be by one of Jean-Jacques Lagrenée, Antoine-François Callet or Guy Brenet.